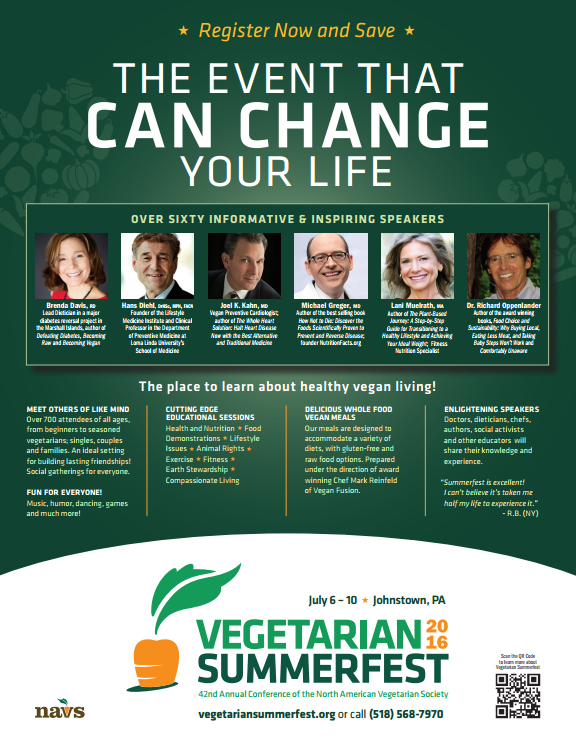 There are many ways you can help us promote Vegan Summerfest! Posters are a great way to let others in your area learn about this important educational event. They can be displayed at the following locations: food co-ops, vegetarian events, health food stores, health practitioner’s offices, fitness centers, environmental meetings, animal rights meetings and others. Either print out our poster, or email us a request and we will send you printed posters. Please consider placing one of our Vegan Summerfest banners on your website to help us reach as many people as possible. Arrange to have our display ads placed in the newsletters of any groups or other associations with which you are affiliated. These ads are also suitable for other publications such as newspapers etc.